Create, send and track effective email campaigns that help build lasting relationships with your customers. Focus on building a relationship with your customers. Automate your email marketing with email workflows and automatic responses. Choose from a list of default bulletin templates or design your own templates to suit your email marketing needs. Know the functioning of your email and social campaigns. Understand your audience better and improve future campaigns. Got your customer lists in Zoho CRM? Sync contacts lists, and also see the results of your campaign within your CRM account. Know where your audience is. Campaigns Share on social networks and also create landing pages for your Facebook audience. Delivery email is our top priority and we make sure that our software provides your email directly to recipients’ inboxes. Start with 2,000 contacts and send up to 12,000 emails / month in the free plan. You can update only when necessary. Get access to the entire Zoho Suite of services when you register with us. You get all the right tools to run your business. Zoho Campaigns gives you a multi-user account. You can keep a single account for all your marketing team. You do not have to worry about backup solutions, updates or maintenance. We make sure that your account is always up-to-date. Use our APIs and connect to your account with other services to generate the right business solution for you. Manage your e-mail marketing campaigns on-the-go! 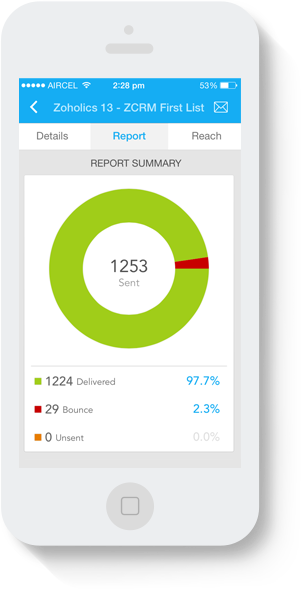 See the result of the campaign, check the growth of your mailing lists or even share reports with a colleague – all from your phone!